Explore Yoga with Depth, Clarity & Heart. Dhyana Yoga Arts offers high quality education with exceptional teachers. Your lead teacher, Deanna Sidoti, is the director of DYA, specializes in Alignment and Yoga for Backcare & Scoliosis. She teaches Vinyasa, Yoga for Backcare, Restorative, Ayurveda, and Teacher Trainings throughout the east coast. Next 300 hour Yoga Teacher Training starts September 2019! Contact us for details. You’ll learn from teachers who walk the walk - they’re experienced, knowledgeable, creative, and cultivate a safe, welcoming, immersive environment conducive to exploring with depth in your practice. Dhyana Yoga Arts Teacher Trainings are celebrated for being exceptional, challenging, creative, well-rounded, and rewarding. 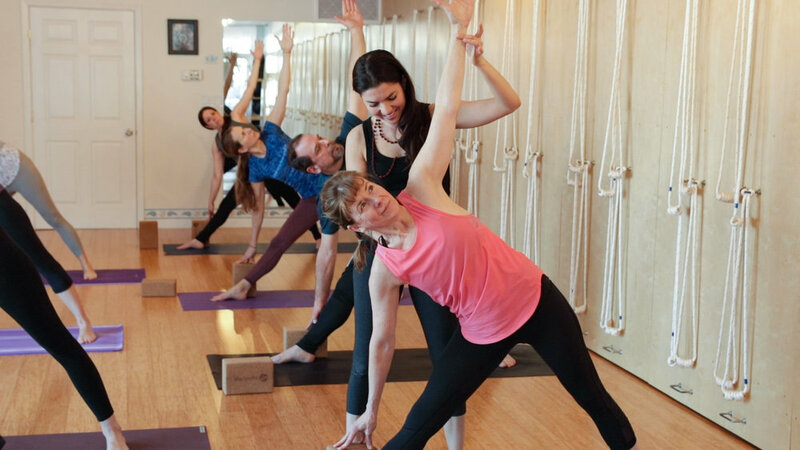 Our expert teaching team will guide you in this journey of deep Yogic exploration, prepare you to teach with confidence and skill, and support you in empowering yourself to nourish your strengths, gifts and knowledge of Yoga. Yoga is about Self-awareness and relationships, and our time together asks for your active participation in the program and in our community. Expect to challenge yourSelf, sharpen your focus, clarify your teaching, dig a Deeper Well, and step into your full capacity. Our Immersions cultivate space for transformation, connection, and empowered, compassionate teaching with Depth, Clarity, and Heart. You’ll expand your knowledge of the Eight Limbs of Yoga, deepen your understanding of what you already know, transform your ever-evolving practice, and make these time-tested ancient practices accessible to your students. Sacred Texts Immersion: including the Yoga Sutras of Patanjali, The Bhagavad Gita, and Tibetan Heart Buddhist texts. Yoga Rope Wall Certification - graduate with a Ropes certification. Restorative Yoga Certification - graduate with a Restorative Yoga certification. Special Populations: including Yoga for Backcare, Yoga for Scoliosis, and Chair Yoga. Ayurveda Immersion - How deep do vata-pitta-kapha go? Intro to Pulse Reading, Spices, Pathology and more with Vaidya (Ayurvedic Doctor) Vasudha Gupta. And much more… to be shared with you when you schedule a 10-minute phone call or in-person meeting with Deanna and submit your short application. $500 non-refundable deposit required to secure your spot. Due within two weeks of acceptance into the training. Payment plans available. Space is LIMITED so all trainees receive plenty of personal attention.